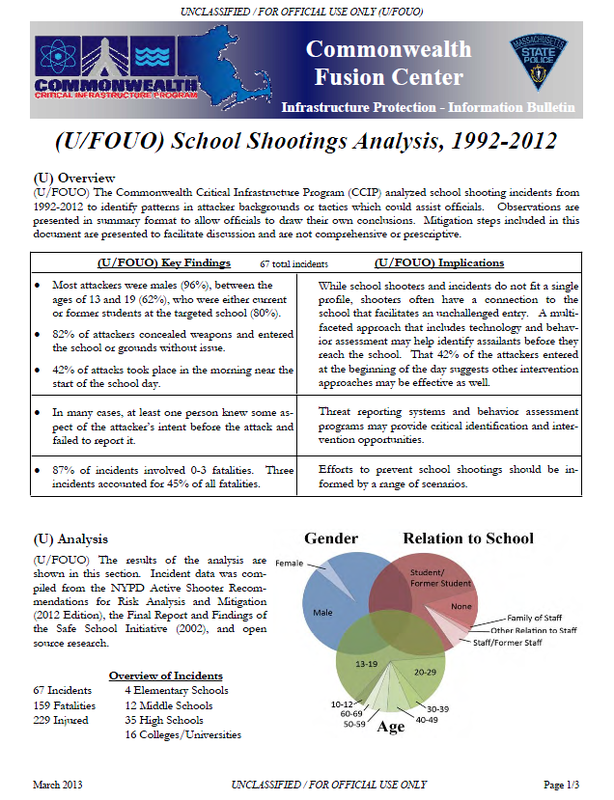 (U/FOUO) The Commonwealth Critical Infrastructure Program (CCIP) analyzed school shooting incidents from 1992-2012 to identify patterns in attacker backgrounds or tactics which could assist officials. Observations are presented in summary format to allow officials to draw their own conclusions. Mitigation steps included in this document are presented to facilitate discussion and are not comprehensive or prescriptive. • Most attackers were males (96%), between the ages of 13 and 19 (62%), who were either current or former students at the targeted school (80%). • 82% of attackers concealed weapons and entered the school or grounds without issue. • 42% of attacks took place in the morning near the start of the school day. • In many cases, at least one person knew some aspect of the attacker’s intent before the attack and failed to report it. • 87% of incidents involved 0-3 fatalities. Three incidents accounted for 45% of all fatalities. While school shooters and incidents do not fit a single profile, shooters often have a connection to the school that facilitates an unchallenged entry. A multifaceted approach that includes technology and behavior assessment may help identify assailants before they reach the school. That 42% of the attackers entered at the beginning of the day suggests other intervention approaches may be effective as well. Threat reporting systems and behavior assessment programs may provide critical identification and intervention opportunities. Efforts to prevent school shootings should be informed by a range of scenarios. (U/FOUO) The results of the analysis are shown in this section. Incident data was compiled from the NYPD Active Shooter Recommendations for Risk Analysis and Mitigation (2012 Edition), the Final Report and Findings of the Safe School Initiative (2002), and open source research. (U/FOUO) Attacker profile – No single profile exists for the school shooter and it is likely that different school segments have different perpetrator profiles. However, certain factors, when taken in context with other evidence and evaluated using a threat assessment methodology (per the Safe School Initiative), may indicate an individual is at an increased risk of violence and provide intervention opportunities. A history of mental health issues was cited in 19 incidents (28%). Difficulty coping with significant losses or personal failures was also noted. Grievances were cited in 23 incidents (34%) and bullying was reported as a factor in 15 incidents (22%). Student status had the strongest connection. Current and former students perpetrated 55 incidents, or 80% of all attacks. This observation has implications for detection efforts. (U/FOUO) Timing – Data shows that 28 school shootings (42%) occurred near the start of the school day, before 11:30 AM. More research is needed, but this observation may indicate intervention opportunities preceding the attacks. (U/FOUO) Warnings – In at least 22 incidents (33%), one or more people knew some aspect of the attacker’s intent through direct statements, or internet posts. Often, these warnings were not reported until after the attack. Threat reporting systems, when combined with education and intervention strategies may be effective. Currently, only 36% of schools have a structured, anonymous threat reporting system. (U/FOUO) Technology – Many schools have invested in technology such as access control systems (92%), security cameras (61%) and metal detectors (1%). However, 55 attacks (80%) were perpetrated by current or former students. This connection to the school likely helped perpetrators bypass access control systems and enter the schools with concealed weapons in 29 incidents (43%). Technological solutions will be more effective if paired with behavior assessment training and response plans. (U/FOUO) School systems, police and the public take school safety very seriously. While school systems work to identify students in crisis and police departments train to improve their response, tragedies like the shooting in Newtown, Connecticut cause everyone to ask what else can be done. Analysis shows that most school shootings are perpetrated by current or former students and this relationship often helped them enter the school with weapons at the beginning of the day. The assailants often had grievances within the school and others often knew of the assailant’s intent. These facts may help target intervention strategies.